The news that an undercover police officer was tasked with trying to find out any information that could discredit Stephen Lawrence's family is terrible and shocking, but unfortunately not surprising. Last year's revelations of police attempts to discredit the victims of the Hillsborough disaster show that this was not an isolated incident. 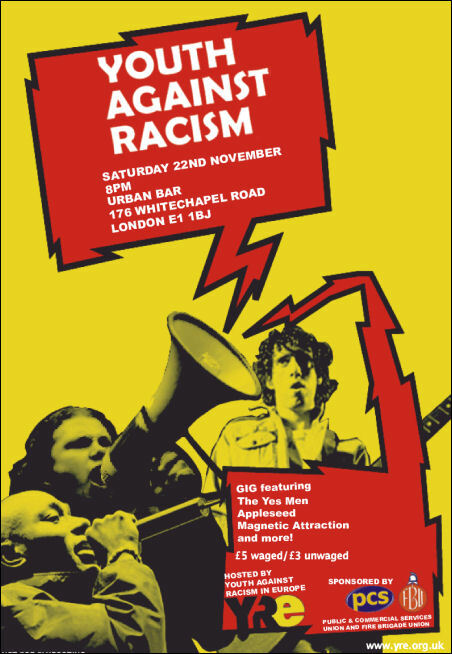 The officer concerned, Peter Francis, infiltrated Youth Against Racism in Europe (YRE) over several years and was known to us as Pete Daley. "It took 18 years for the police to convict any of Stephen Lawrence's murderers. Meanwhile, time and money was being spent searching for 'dirt' on a bereaved family, and secretly infiltrating Youth Against Racism in Europe, a peaceful organisation of young people, which was organising mass protests against racism and the BNP. As has been widely covered in the media, the BNP lost 27 councillors in the 2010 local elections, only retaining two that were up for re-election. Although they still have 19 councillors nationally. Their biggest drubbing came in Barking and Dagenham where they lost all 12 seats after it had been widely reported that they could take control of the council. On the surface it would appear the BNP have been beaten, or even at least severely wounded but this is the easy way to look at it. The Observer's video shows footage of the YRE's campaign to remove the BNP from Brick Lane, in Tower Hamlets, East London. It was this victory by the local community against the BNP which motivated the Met Police to infiltrate the YRE, according to the video footage claim. The only place the BNP had won a council seat at that time was in Tower Hamlets, in 1993. 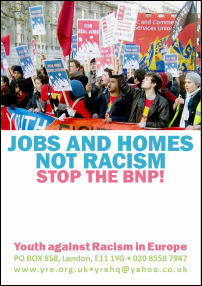 Youth against Racism in Europe played an important part in defeating the BNP and driving them out of Tower Hamlets at the time. While the situation we face is different now, many of the ideas and methods that were used then are just as appropriate and can be adapted to today's struggle. This article explains the YRE's role in fighting the BNP in Tower Hamlets during the 90s. The disgraceful article in today's Observer (Undercover policeman reveals how he infiltrated UK's violent activists, 14 March 2010) claims to 'expose' how "an officer from a secretive unit of the Metropolitan police" was "working undercover among anti-racist groups in Britain, during which he routinely engaged in violence against members of the public and uniformed police officers to maintain his cover." The BNP have won two seats in the European Parliament with 943,000 votes across the country. Many people will be outraged and disgusted that this far right, racist group has another platform to air their views. Despite attempts to appear respectable in front of the media the real nature of the BNP leadership keeps being exposed. Eddy O'Sullivan, a candidate in the North West, was discovered with vile racist comments on his facebook profile. In London a black nurse was subject to a torrent of racist abuse from a BNP activist when she complained about getting a BNP leaflet through her door. The BNP and their views are opposed by the vast majority of people. The election of two BNP MEPs needs to be met with a wave of protest to make our opposition clear. In a series of recent reverses, the BNP have shown their weakness in cities like Manchester and Salford, while in opinion polls the BNP remain below the percentage needed to win a seat. With one day until the Euro-elections and some local elections, it is still possible to prevent the racist right winning seats. FIGHT FOR JOBS � STOP THE RACE TO THE BOTTOM! The strike of construction workers which began last week is continuing and looks as if it is spreading throughout the country with Sellafield and Heysham nuclear plants out. Workers at other plants, according to the BBC, have also decided to stay out, these include Grangemouth and Longannon in Scotland. Warrington and Staythope in Newark are also out as well. The strikes are spreading from fiddlers ferry in Warrington to the Drax power station in Yorkshire. The media are saying that the strikes are against foreign labour, while the government attacks striking workers for wanting protectionism. Despite the huge amounts of media coverage the British National Party has received over the years, the publication of their list of members, ex-members and others makes it clear that the BNP is a relatively small party. In fact the very publication of the list by a disgruntled member reflects the divisions and splits the BNP regularly faces. Two peaceful demonstrators leaving Saturday�s Unite Against Fascism demonstration in Blackpool required hospital treatment for injuries received in an unprovoked attack from a politically-motivated thug. build the campaign to stop the far-right! Stop the BNP summer camp! The BNP�s annual 'Red, White and Blue' festival is planned for mid-August. We call on anti-BNP campaigners to join the protests against this on Sat 16 August in Derbyshire. To mark the 15th anniversary of a major miscarriage of justice we are protesting outside the police station where Oliver Campbell was first arrested. Attack on British "scroungers" does nothing to help migrants -- we need a living wage and rights at work for all! It's sad that in championing the rights of migrants Yasmin Alibhai Brown feels that it is acceptable to attack the existing population of Britain with the prejudices and assumptions often directed against migrants: "too lazy or expensive", "indolent...scroungers" (God bless the 'foreigners' willing to do our dirty work, 23/8/06). THE FAR-right British National Party (BNP) achieved significant advances in the May 2006 local elections, where they won 33 more councillors bringing their total to 55 nationally. Their gain of eleven councillors in Barking and Dagenham hit the headlines most but this was not an isolated development. "Dodgems � who needs them when we can go round & round in circles by ourselves and get skint and whiplash in the process?" "Oliver Campbell should not have to wait a moment longer for justice"
Support the campaign to clear Oliver's name! In May 2005, four neofascist European groups (NPD from Germany, Forza Nueva from Italy, Falanx from Spain and Chrisi Avgi from Greece) announced that they would organize their first European Youth Camp on the 16 - 18 September in Greece, without specifying the exact location. As hundreds of thousands gather to protest against world poverty and environmental destruction outside the G8 (group of eight richest nations in the world) summit in Gleneagles, YRE looks at the hypocrisy of Western leaders like Gordon Brown & Tony Blair posing as the "saviours" of Africa and how refugees from around the world are treated in Britain. "I escaped and came to England on the 26th of November 2002, but instead of finding refuge here I have been drowning in problems; since I came to this country and presented myself to immigration as an asylum-seeker, I have suffered the evils that I was trying to forget yet again. I have been held in detention since the 29th August 2003. 10th February 2005 Holocaust Week 2005: who was responsible and what should we remember? YRE produces a range of educational resources aimed at combating racist ideas and encouraging people to oppose racism and other forms of prejudice. At the moment we are updating our anti-racist education pack.